The post about my jeans skirt has had a lot of interest so I decided to do a basic tutorial for the jeans to skirt transformation. This idea is not a new one and there are plenty of tuts and varying methods, this is the way I do it. Take an old pair of old jeans that you can still fit at the waist but don’t wear anymore, because of worn knees for example. Cut about 2-3cm longer than you want the length of skirt to be. 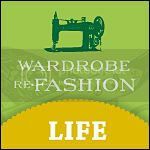 You need to allow for a hem if you are having one and a bit extra for realigning the edge. This one I cut even shorter after I took the photo as I am going to put a ruffle on the bottom. Unpick leg seams and about half the crotch seams, to where the seam straightens out. Open and lay the flaps over each other, pin. insert under opening and pin together. Sew the insert stitching in the centre of the original seam allowance, and zig zag the cut edges if you want. Cut away the excess up to 1cm away from the seam. I like to put an extra row of zig zag stitch where the original seam was, one, to reinforce if this area is worn, and two, to stop the underneath insert panel edge from fraying. Hem the skirt if you want, or leave to fray. I decided to add a frill on the bottom. 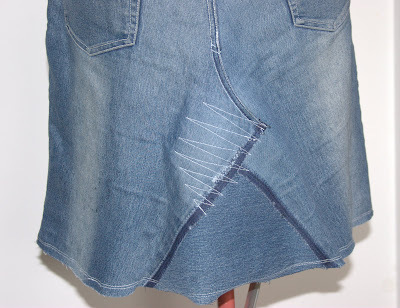 I joined strips of leftover denim to make a large circle, almost twice the width of the skirt’s bottom edge. 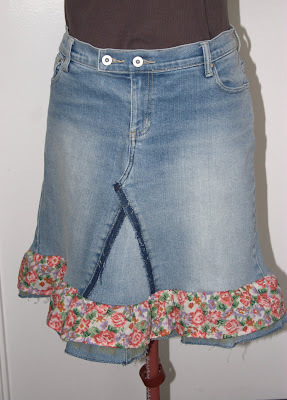 I added some gathered tulle and a strip of floral printed cotton to the denim strip and attached to to the bottom of the skirt, gathering as I went. Here’s another one I prepared earlier. This one has a double row of stitching at the hem so it doesn’t fray too far. It will look more “raggy” after a wash and tumble dry.